We are in Bar Harbor, Maine this week located on Mt. Desert Island on the outskirts of Acadia National Park. 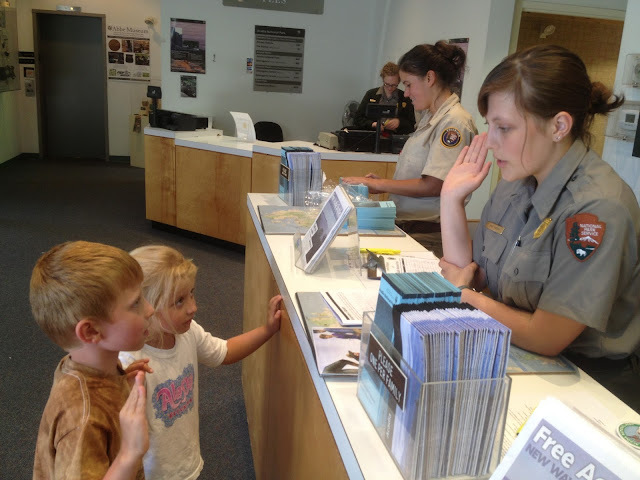 We attended a couple of Ranger-led programs for the kids last week where Elisabeth saw kids complete their Junior Ranger Program requirements, get sworn in, and become Junior Rangers of Acadia National Park. After which, she excitedly turned to me with her best pout face while vigorously tugging on my shirt, and indicated in no uncertain terms that she wanted to do that - "I want to be a Junior Ranger mommy. Can I, can I?" So we talked to the Ranger about the program and she gave them each a booklet. Elisabeth was excited to do the "homework" inside, while Jonah rolled his eyes and said, "More homework" but agreed, albeit reluctantly, to complete the program. The Junior Ranger Program is fairly extensive with programs in existence for many of the National Parks. (For this blog post, I was checking out the website for the Junior Ranger Program and was surprised to see curriculum options for many of the parks as well.) We are homeschooling and this kind of program is exactly the kind of activities I like to incorporate into their learning. With this traveling lifestyle, they have lots of opportunities for hands-on experiences on which we can base the fundamentals of reading, writing and math. 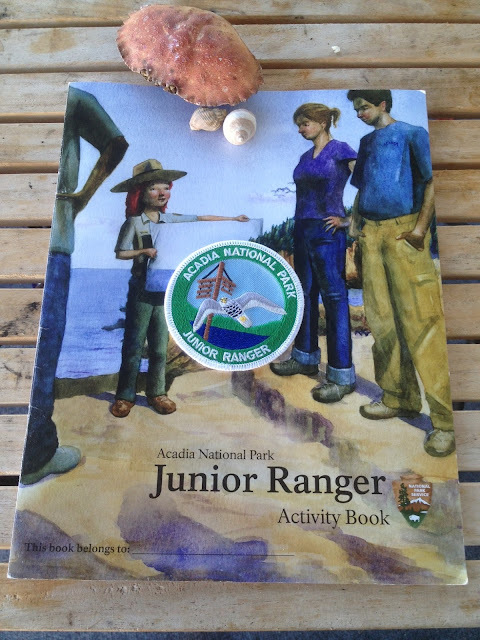 The Junior Ranger booklet for Acadia NP contains 14 different activities related to knowledge of this particular park with varying degrees of difficulty and covering a range of topics such as geology, marine biology, history and environmental protection. Ages 7 and under are only required to complete 5 of the activities - which is plenty considering how just writing a few words at this age is quite a struggle. Every child regardless of age is required to attend at least one park program, write down the details of the program, and interview a park ranger different than the one listed for the aforementioned program. Once complete, the child shows their booklet to a park ranger and they are led in a pledge (a rather long one too) to protect Acadia National Park. The park ranger then signs and dates the certificate on the back of the booklet, records their names on a roster, and hands them a patch for that park (see above photo). Afterwards, Elisabeth asks with a sense of awe, "Mommy, am I really a Junior Ranger?" To which I reply, "Yes, you are a Junior Ranger at Acadia National Park. And the next National Park we go to you can become a Junior Ranger there too." She was very pleased. You could tell they were both taking it very seriously and really taking the pledge to heart. Jonah said to Elisabeth, "You know, you can't pick flowers any more. That's not how you protect the park." Elisabeth said, "I know...."
Hey kids, proud of you for becoming rangers,come on Jonah,see you can do it also,don't pick the flowers reminder was good.